In this update, fossil-fuel rich New Mexico is the latest state to join the 100-percent-clean-energy club, a strong sign of the momentum building for pro-renewable policies across the U.S. New Mexico’s Democrat-led House charted a course for the state to obtain all of its power from carbon-free resources by 2045, with intermediate goals of 50 percent by 2030 and 80 percent by 2040, following passage of the Energy Transition Act. 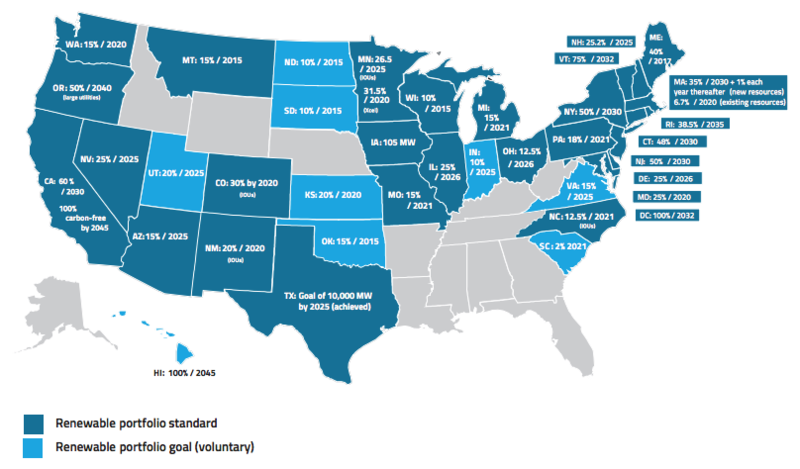 State renewable portfolio standards are a key driver behind the torrid expansion in wind and solar, responsible for about half of the nation’s deployment of the clean energy sources over the last couple decades, according to a report by the Lawrence Berkeley National Laboratory. Over three dozen states plus the nation’s capital have set compliance standards or voluntary targets. Plummeting costs of the technology and dire warnings about the impacts of climate change have emboldened elected leaders to set ever-more aggressive standards. Last year California and Washington, D.C., famously enacted mandates to source 100 percent of their electricity from renewable and zero-carbon resources over just a couple of decades, with other states floating similar proposals. Meeting just the existing targets will be no small feat, requiring an approximately 50 percent boost in renewable generation by 2030, or about 56 gigawatts of new capacity, according to the national lab.